Konami’s second (and final) crossover platformer is a far different entity from its predecessor. All adventure elements are excised in favor of focusing on the action, resulting in a faster-paced and overall more enjoyable experience. 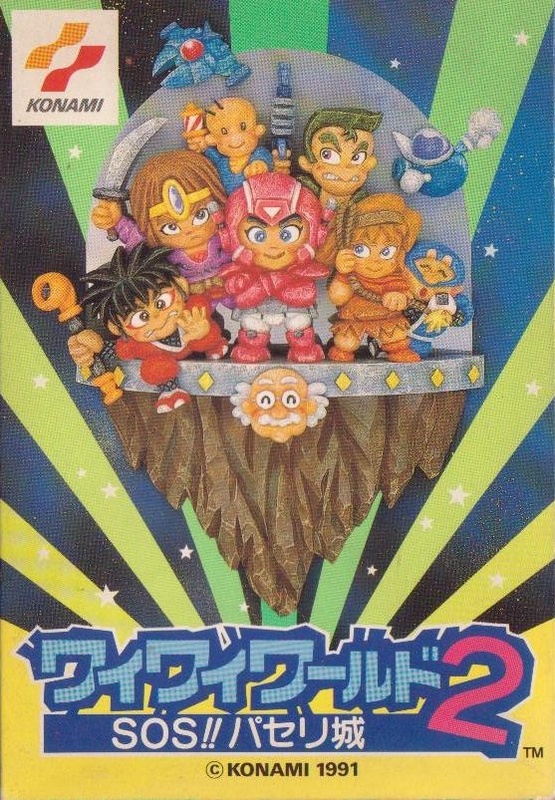 The plot involves an evil ghost-like villain named Warumon (a name that would be used three years later in TwinBee for the villain Dr. Warumon) kidnapping Princess Herb of the peaceful Parsley Castle, prompting Dr. Cinnamon to create a suspiciously Mega Man-esque hero robot named Rikkuru to save her. Rikkuru is a competent fighter on his own, but he has the ability to channel the power of several Konami superheroes to crush his opponents. 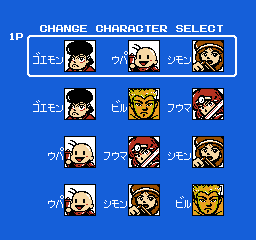 Before the game starts, you get to choose between four choices of three Konami heroes from a total pool of five all-stars. 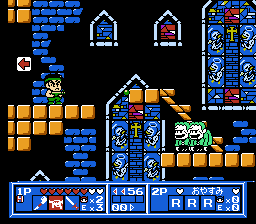 Goemon, Simon Belmont, and Fūma return from the first game along with two new fighters: Baby Upa from Bio Miracle Bokutte Upa and commando Bill Rizer from Contra. Upa’s game of origin never made it to American shores until 2008 on the Wii Virtual Console, but it is a creative platformer in which Upa must bonk enemies with his magic rattle to inflate and ride them upwards like balloons. 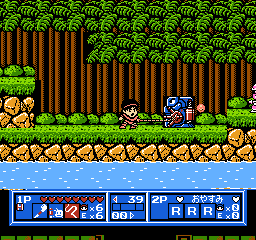 Bill is definitely more recognizable, from the popular high-action run-and-gun Contra series. You are primarily in control of Rikkuru, who trots at a decent pace and attacks with a quick crescent projectile that travels through about a quarter of the screen. It is not a powerful attack, but it beats out Konami Man and Konami Lady’s punches and kicks. Rikkuru does have the added advantage of a double jump, good for avoiding pits and enemy fire. He can also take eight hearts’ worth of hits before he loses a life, and there are medkits to heal him. However, you will likely not be Rikkuru for too long once you pick up a C icon (provided by floating containers akin to Contra), as this causes the three character icons to flash red one by one. Like the first Wai Wai World, jumping while holding Up will transform you into whatever character icon is currently highlighted. You remain in that form for sixty seconds, during which you are technically invincible, as each hit just takes five seconds away from the clock instead of hearts. You morph back into Rikkuru when time runs out, though medkits can boost the timer and picking up another C icon allows you to re-morph into your current character or choose a new one. Unlike the first game, it is not crucial to pick any specific character for unique situations; everyone has advantages and disadvantages, but they are all essentially power-ups who exist to do more damage than Rikkuru and take punishment in his stead. 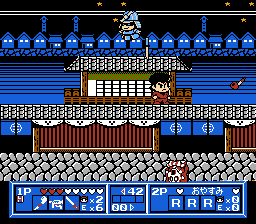 Goemon tosses pipes which boomerang back to him about one-third across the screen, Simon’s iconic whip does good damage but is a bit slow, Fuuma’s sword is strong but has short range, Upa’s rattle is quick and turns enemies into platform clouds, and Bill fires quick bullets full range across the screen. The levels this time around are completely linear, and while some may miss the exploration element of the first, the flow of the game works better as a straight-up action-platformer. 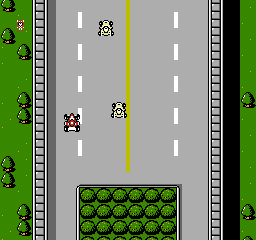 Admittedly, things start out slow with the first level, which automatically scrolls at a sluggish pace; however, the autoscrolling is justified for the second segment of the stage where Rikkuru commands a small jet fighter in a Gradius-like shoot-em-up sequence. Things take off at stage two, an affectionate homage of the Goemon series set in feudal-era Edo with soldiers wearing helicopter helmets as propellers, ballerina sumo wrestlers, and a pogo stick samurai as the boss. 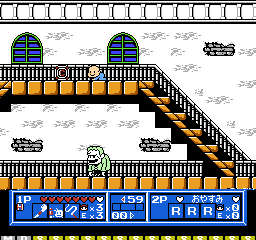 Stages four, five, seven, and nine are also platformers, respectively based off the origins of Bill (an alien-ridden jungle), Upa (a delicious candy land), Fuuma (the Makai) and Simon (an ominous castle). 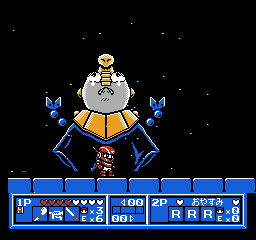 The final stretch contains small versions of familiar bosses from each characters’ series (like the Cyclops from Castlevania III) before you reach the last battle with Warumon, who is super-simple to defeat as Bill. 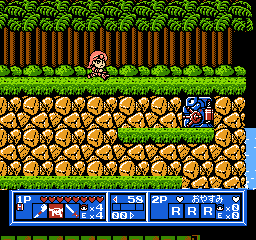 The remaining three levels, announced by Konami Man and Konami Lady, switch up the gameplay style. 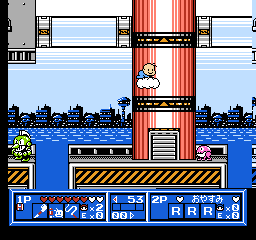 The third level is an overhead shooter where you pilot the TwinBee. 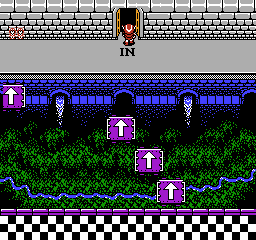 You get to select between two different levels, and this segment actually plays faithfully like the original TwinBee before switching to a Space Harrier-esque bonus stage where you have to collect as many bells as possible. The sixth stage is particularly bizarre, as it offers a choice between two completely different genres. The first choice faces you off against three sliding puzzles where you have to form the full image while also keeping Konami Lady protected from a rogue train at the bottom of the screen. 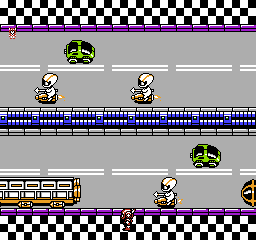 The second selection is an overhead racing segment, which is based on the (best forgotten) racer Road Fighter. Finally, the eighth level has you pick one of two levels to pilot the Vic Viper in a horizontal shooting sequence. 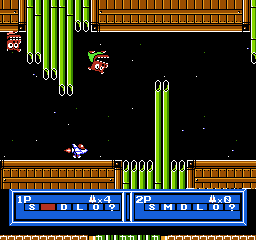 While you use the standard Gradius arsenal, the cutesy graphics bring its semblance closer to Parodius. Just when you think you have beaten this section, in swoops a giant battleship which looks like the classic Big Core from the original Gradius, an impressive boss by NES standards. 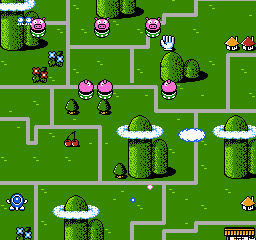 Wai Wai World 2 is one of Konami’s best latter-era Famicom titles thanks to innovative level design, bright and colorful graphics, delightful soundtrack full of familiar tunes from other Konami games, and an overall more refined feel than the first game. 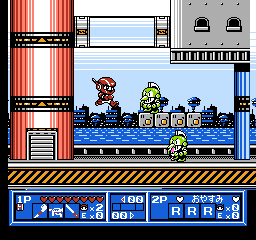 It also offers simultaneous two-player support where the second gamer controls a blue Rikkuru, as well as Winbee and Lord British in the respective shooter segments. If there is anything negative to be said (aside from the slow first stage), the game is almost too easy to beat. 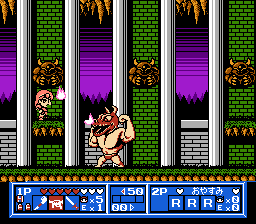 This is preferable to the hair-tearing infuriation the first game could incur, and the game rarely gets boring due to its level variety, but it does feel like the enemies could be stronger and the bosses more erratic. 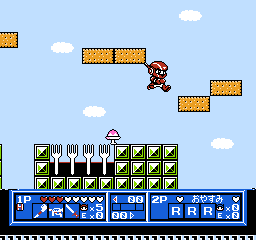 It is made easier by the transformation power-ups, where you can literally wait as long as you need to choose which identity you want to assume. You can keep the change cursor going until you run out of time with your current hero and immediately transform again. 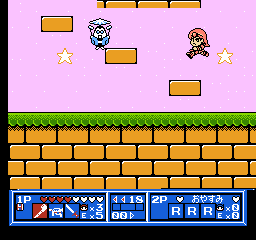 Unless you have a predilection for falling into death pits (where the amount of tricky jumps is surprisingly low for a Konami game), you can remain potentially invincible with careful power-up usage. 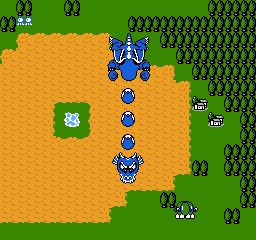 The Gradiussection might be the toughest part due to losing lives instantly if you are not protected by a shield, and the prelude to the Castlevania level strangely begins with a minigame that plays like Frogger, where all enemy vehicles can destroy you in one hit if you’re not careful. Even if these are the only segments where the game gets tough, you simply start at the beginning of the current stage when you die and have limitless continues. While not a hard game, Wai Wai World 2 is a fun one, and that is all that counts for the best Konami crossover game without the portmanteau “Parodius” in the title.